The Blackmagic URSA Mini 4.6K EF Mount Cinema Camera sports a 4.6K sensor with 15 stops of dynamic range. You can record uncompressed RAW footage directly to 2 CFast cards up to 60 FPS. This camera will also record, on a smaller portion of the sensor, slow-motion footage up to 120 FPS at 1080p. At these high frame rates, the URSA Mini will conform your capture to the set standard frame rate resulting in smooth footage to reduce post processing work. 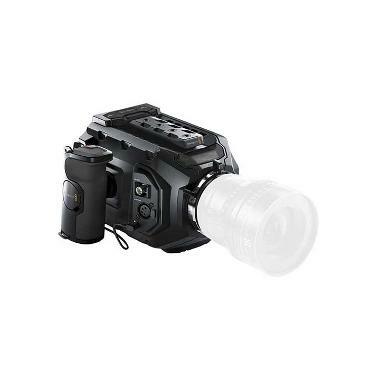 The body of the camera is small, ergonomic, and features a large LCD touchscreen monitor. The URSA Mini is ideal for run-and-gun style shooting, small-space settings, music videos, documentaries, and more. Please note that this camera does not have its own internal battery. Included in this rental is an Anton Bauer URSA Gold-Mount Plate for the attachment of Anton Bauer batteries, such as the Anton Bauer Dionic 90 Battery or the Anton Bauer Digital 90 Battery (batteries are rentable separately). Otherwise, this rental also includes an AC power cable. Due to intermittent manufacturer audio issues with these cameras, we cannot guarantee quality of audio recording. We strongly recommend renting (or using your own) audio recorder separately. A good option is the Zoom F4 Multitrack Field Recorder. • A lens is not included with this camera. CFast cards are also not included. Click here for a list of recommended CFast cards. • This camera does not have its own internal battery. Included in this rental is an Anton Bauer URSA Gold-Mount Plate for the attachment of Anton Bauer batteries, such as the Anton Bauer Digital 90 Battery (batteries are rentable separately). Otherwise, this rental also includes an AC power cable. • This camera also doesn't have HDMI out. Rental of the Atomos Connect Converter is recommended for converting signal to HDMI. • DaVinci Lite Software is not included but can be downloaded here. • Warning: XLR audio prone to breakage - known issue, please plan accordingly.